Congratulations, Mighty Marlin Swim Team! The Smoketree Mighty Marlin swim team capped off another excellent season in the summer of 2018. Coming off their undefeated season in 2017, the Mighty Marlin were bumped up from the D division to the B division of RMAL — facing tougher opponents than the year before. It was going to be a challenge for Smoketree to be competitive in this higher division, but the Mighty Marlin rose to the challenge — finishing the season 3-3, with wins over Brighton Green, Shenandoah and Bon Air. Not only did the Mighty Marlin perform well this season, but they had a great time working as a team. Forty-two members who took our 2018 Member Survey ranked their experience with swim team 4.4 out of 5 stars! Several had glowing comments about the program and its coaches. This was the second season for Head Coach Chrissie Callis — a native Richmonder who competed at the collegiate level and now lives in the greater Smoketree community. Parents and swimmers alike appreciate Coach Chrissie's engagement, dedication and professionalism. Swim Team can't happen without the dedication of parent volunteers who make sure the season goes well. Parent Representative Phaedra Clark put in countless hours before and during the season, and Volunteer Coordinator Mary Parker also worked hard securing the volunteers needed — as well as working multiple shifts herself — during the meets. Thank you to all our parent volunteers. The Mighty Marlin couldn't do it without you! Head Coach Chrissie Callis works with a Mighty Marlin swimmer. One of the primary goals of the Smoketree Aquatics Committee was to ensure that Smoketree Pool served as the embodiment of community spirit we want in our neighborhoods. 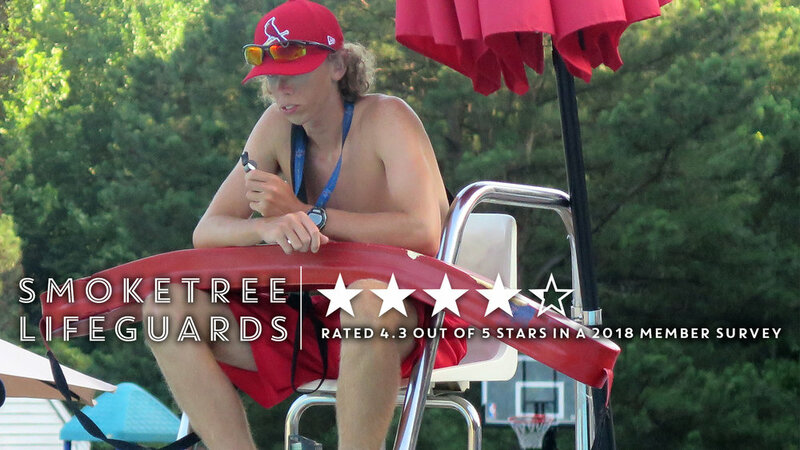 One of the ways we wanted to foster that spirit was to go back to hiring teens and young adults from our community to serve as lifeguards at Smoketree. The 2018 pool season is underway, and the Smoketree Aquatics Committee (AQC) is hoping you're enjoying the pool so far! Our committee has two main priorities for each pool season; 1. Make sure everyone using our facility is safe; 2. Make sure every member has an excellent experience, but never at the expense of safety! You’ve surely heard of the Smoketree Aquatics Committee (AQC). The AQC is a committed group of pool members who start working each October to coordinate and facilitate the following pool season. I hope this message finds you in good health and eager for Spring weather to grace our beautiful community. The board of directors of your Smoketree Association has made a number of changes in the past few months. The 2017 pool season is long gone. Both the Main Pool and the Game Pool are covered until spring. The Smoketree Aquatics Committee (AQC) is proud of what we accomplished with the pool this past season; membership and revenue were both up, and because of this we were able to make significant improvements to the facilities again this year.